Dash Core v0.13.0.0 will automatically activate DIP002, DIP003 and DIP004 once 80% of the network has upgraded. Mining pools must mine an upgraded block and pay an upgraded masternode to successfully signal the upgrade in a block, and 80% of blocks in a window must signal in order to lock in the upgrade. Please confirm the status of network uptake before proceeding as the upgrade path differs slightly depending on on your timing. 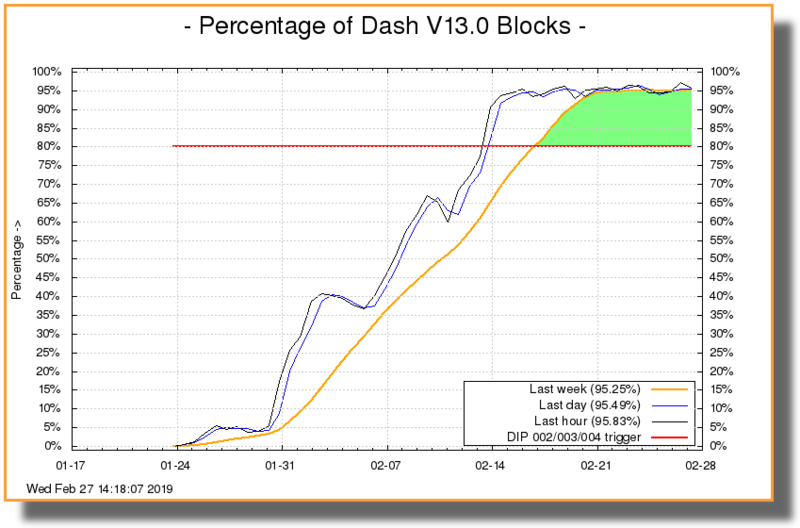 If you are updating to Dash Core v0.13.0.0 prior to this 80% threshold you should be able to simply shut down the daemon and replace it with the updated binary. If you are updating to Dash Core v0.13.0.0 after this 80% threshold is reached please note that you will need to re-index the chainstate using the “-reindex-chainstate” command. Please note that Dash Core v0.13.0.0 requires a one-time upgrade to all related software and libraries to ensure continued compatibility.